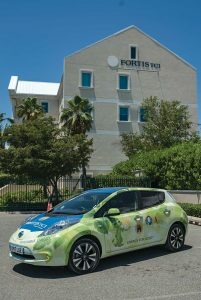 FortisTCI introduces its electric vehicle program. Driving in Providenciales during morning and evening “rush hours” or in the aftermath of a road closure or traffic accident reveals the sheer number of vehicles operating on the roadway. This exponential growth over the years mirrors that taking place around the world. Vehicle emissions continue to add to the steadily rising global CO2 levels that are so affecting the climate and, in turn, every ecosystem on the planet. With this in mind, FortisTCI in April 2018 launched its first electric vehicle and charging station. It is part of a year-long feasibility study to see how this new technology can best “merge” into the Turks & Caicos Islands’ driving future. FortisTCI introduced its first electric vehicle in mid-2018, the Nissan Leaf Acenta. Right now, the FortisTCI Leaf is driven by employees during business hours for errands and charged at the station in front of the corporate office. The goal is to get Islanders used to the concept, bring more awareness to the general public and encourage purchases by individuals and businesses. Although the initial cost may be higher (the 2019 Leaf currently retails at about $30,000), because there is no “engine” per se, duties on electric cars are only 10%. There is also no need for oil changes and “fuel” costs, as noted above, are drastically lower. Part of FortisTCI’s feasibility study is to determine the total cost of ownership over the life of the vehicle and see if it is a truly sensible option. In fact, the Nissan Leaf is the best-selling, highway-capable electric car in history, with over 350,000 sold worldwide as of September 2018. Styled as a five-door hatchback, it is aerodynamic and can attain speeds approaching 95 mph! Typical battery life is about 10 years, which may be slightly less in the Caribbean sun—one reason why the FortisTCI vehicle is always parked under shade. Drivers report super-quick acceleration and a smooth and silent ride. 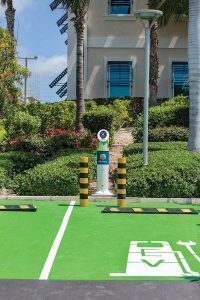 The EV charging station is in front of FortisTCI’s corporate office on Providenciales. Archie Gaviola says that, to the extent that it makes both operational and business sense, FortisTCI wants to be THE company to start a fleet transition strategy from fuel to electric-powered vehicles. In fact, part of their investment involved electric vehicle repair and replacement training for the FortisTCI vehicle services team in April 2018. This was followed by specialized training for emergency responders in handling accidents involving electric vehicles and their specialized systems. There are already several TCI car dealers who are becoming electric-vehicle certified, as they look towards the future. Long-range plans will be to encourage government and public employees to consider using electric vehicles. As reported in the Summer 2016 issue of Times of the Islands, FortisTCI is on track to launch its one megawatt, large-scale solar project by the end of 2019. This follows on the heels of the first installed grid-tied solar energy systems on commercial properties in Providenciales in 2017. Grid-tied solar programs—Customer Owned Renewable Energy (CORE) and Utility Owned Renewable Energy (UORE)—are available to both commercial and residential customers across the Turks & Caicos Islands. FortisTCI currently has half a megawatt of solar energy connected to the electricity grid and expects to complete installation of another half megawatt from customer programs by June 2019. For these remarkable efforts, FortisTCI was recently awarded the Caribbean Renewable Energy Forum’s 2018 “Best Distributed Generation Program” award for its CORE and UORE solar options. These solar options were designed to encourage the adoption of solar energy technology and to help create a more sustainable energy future for the TCI. Participating customers receive credits on their monthly electricity bills to help offset energy costs while also helping to reduce impacts on the environment.